Muslim pilgrims sit inside their accommodation after their arrival at Arafat during the first day of the annual hajj pilgrimage, near the holy city of Mecca, Saudi Arabia, Sept. 10, 2016. Nearly 2 million Muslims from across the globe have converged on Saudi Arabia for the annual five-day Hajj. Iran is boycotting this year's Hajj, citing Saudi “incompetence” and a poor response by health and safety officials. Masses of Iranian Shi'ites have instead converged on the holy Iraqi city of Karbala for an alternative pilgrimage. During last year’s pilgrimage, several hundred Iranians were among at least 2,000 people crushed to death in a stampede in Mecca. This is not the first time Iran has boycotted the Hajj, but it comes at a time when tensions with rival Saudi Arabia are at a record high over conflicts in Syria and Yemen, where Tehran and Riyadh support opposite sides. Saudi Arabia cut ties with Iran last January after demonstrators set fire to the Saudi Embassy in Tehran following Riyadh’s execution of a prominent Shi'ite cleric, Sheikh Nimr al-Nimr. The pilgrimage is one of the five pillars of Islam. All able-bodied Muslims who can afford to do so are expected to take part in the Hajj at least once in their lifetimes. Saudi Arabia has doubled down on safety and security in a bid to avoid a repeat of last year's disaster. The publication Arab News reported that authorities had conducted 1,000 health and safety training courses in recent weeks and deployed 26,000 medical, technical and other official personnel to pilgrimage areas in Mecca, Medina, Arafat and Mina, along with a fleet of more than 175 ambulances. Security officials have placed 1,000 cameras at strategic locations to allow constant monitoring of events. Muslim pilgrims make their way at the Grand Mosque in the Muslim holy city of Mecca, Saudi Arabia, Friday, Sept. 9, 2016. All pilgrims are being outfitted with water-resistant e-bracelets equipped with bar codes that link to personal information, including medical records, in an effort to facilitate treatment in case of illness or injury. Health, however, is only one concern. In early July, three suicide bombers struck separate targets across Saudi Arabia, including the site in Medina where the Prophet Muhammad is believed to be buried. No group claimed responsibility for the attacks, which Saudi Arabia believes was inspired by the Islamic State group. The bombings have raised questions about the kingdom’s ability to protect Saudi citizens and visitors during the Hajj. Authorities have limited the number of visas for each country in an effort to control crowds. All “guests of Allah” are required to carry permits, and police have set up security checkpoints to prevent unauthorized pilgrims from entering the holy sites. It has also vowed strict punishment for all offenders. During the Hajj, devoted Muslims perform a series of religious rituals, including walking counterclockwise around the Kaaba, the cube-shaped structure at the center of the Grand Mosque of Mecca, which Muslims believe is the spot where the Prophet Abraham built his first temple to God. They will also drink the alkaline water from the Well of Zamzam, believed to have healing qualities, and perform a symbolic stoning of the devil. 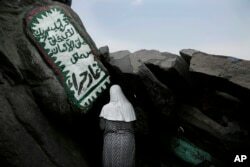 A Turkish Muslim woman prays inside Hiraa cave, where the Prophet Muhammad received his first revelation from God to preach Islam, on Noor Mountain, on the outskirts of Mecca, Saudi Arabia, Sept. 9, 2016. "Part of the rituals also includes feeding the poor," said Tawfik Hamid, a senior fellow at the Potomac Institute for Policy Studies. "Many Muslims believe that once they do the Hajj, all their previous sins will be forgiven by Allah, and they will become sinless as the day they were born." The Hajj is followed by Eid al-Adha, which is on Monday. It is Islam’s most important holy day and marks Abraham’s willingness to sacrifice his son, Isaac. Muslims across the world celebrate Eid al-Adha by killing and sacrificing cows, sheep or goats in a display of religious devotion.